The kitchen is the place where you prepare your foods. It cannot be compromised by bacteria or germs or the results could be both dangerous and even fatal. There should be no half stepping regarding yours and your family’s safety in this regard and there are practices and tips to minimize the risks. You can’t get rid of all bacteria and germs but you can minimize their presence by following some specific practices. First you have to look at who and what enter your kitchen. Although we love them, we should keep pets out of the kitchen. They track in microbes from outside or from other pets or people and can do so in spots that you wouldn’t think they can access. If you can’t keep the pet out of the kitchen, then make sure you follow it around so that you can clean those spots that the critters get into. This means toys they chew on too. The surfaces of the kitchen area are where the microbes rest on. 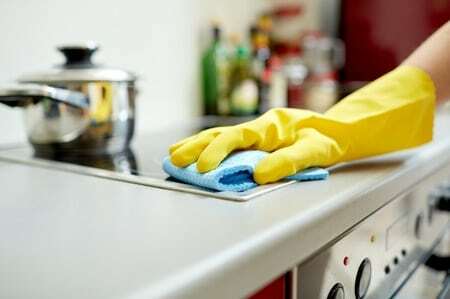 Kitchen cleaning here calls for a cleaner that is a disinfectant that won’t harm the counter tops or table tops or the appliances nor are toxic to people. Using sponges and cloths are another area of kitchen cleaning that you have to be careful of. Sponges can be a place where bacteria thrives. You need to clean your sponges daily by dipping them in an anti-bacterial solution. Hot water doesn’t work unless you boil your sponges and also your cloths you use to clean with. Microbes can withstand incredible temperatures, but they can’t survive the chemicals and compounds that disrupt their biological functions such as a good anti-bacterial solution. Clean sponges and cloths daily. Find a bucket that you can place somewhere and at the end of the day, put the sponges and cloths in there with a good amount of disinfectant and water. The next morning, take them out and rinse. Have tow sets of cleaning cloths and sponges. One for day, one for night. This way you’ll have a readily available arsenal of kitchen cleaning materials. Floors need a good mopping with disinfectant especially. If you walk around your kitchen in shoes and so do the other family members, there’s no telling how many microbes get onto the floor’s surface. Sweeping won’t do jack. You need to mop daily, especially if you have pets or babies that like to play on the floors. Ten minutes a day to clean that floor at night or in the morning means getting a foothold on preventing bacteria and germs from dominating. Remember to wipe down appliances and handles once a day that see lots of activity like the fridge door handle and kitchen doorknobs. These places often miss the attention of the need for constant cleaning but are the most infected areas. No need to mention the importance of disinfecting the sink or the table top where we eat. Overall, getting a great arsenal of disinfectant cleaning solutions, as simple as vinegar and water, and establishing a regimen of cleaning daily by all members of the household, you’ll have a kitchen cleaning procedure that all can take responsibility for and minimize the risks caused by those itty bitty critters of the microscopic kind.